Had another short break in Tioman AGAIN! 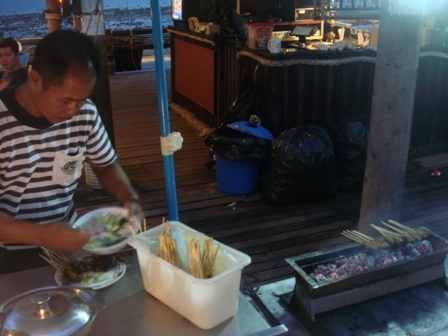 Went back there to log more dives & eat the SATAY!!!! Love the satay there! It’s succulent, juicy & has the right amout of sweetness to it. 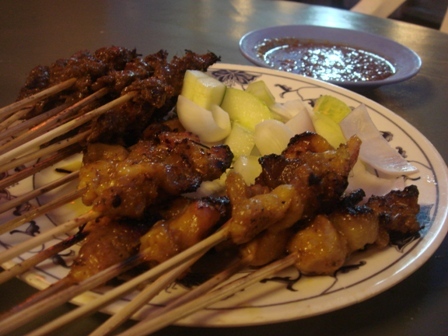 So far this satay is my all time favourite! 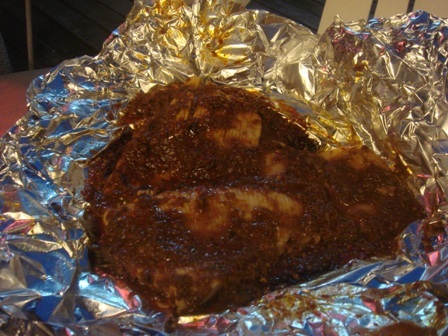 The other thing that I missed so so much in Tioman was it’s Sambal Stingray. The stingray is delivered fresh daily to the BBQ seafood place and it always comes, soft and slightly burnt with no fishy smell cos it’s so fresh! This time we tried a new item on the menu – Otah. 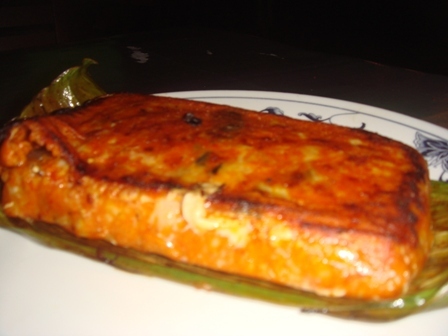 This Otah is a speciality from Muah and I loved it! 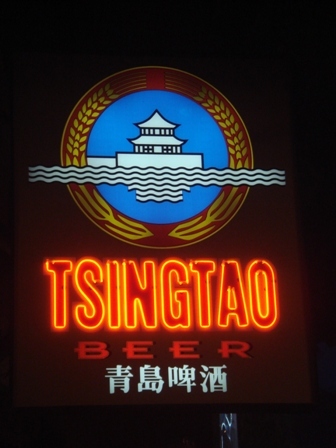 Tho’ I don’t drink beer because I’m allergic to it, I thought this sign looks damn retro! Caught this beautiful sunset in Tioman. And that’s just me strolling on the beach after a day of diving! Dived a total of 9 times over 2.5 days there! So Happy! BTW, all these yummy food is at Paya Beach Resort, Tioman. It’s cheap & good! I love the sunset picture! I hope to take such shots when I go NZ. You have a healthy looking tan there…….hehe! I love that pic too! 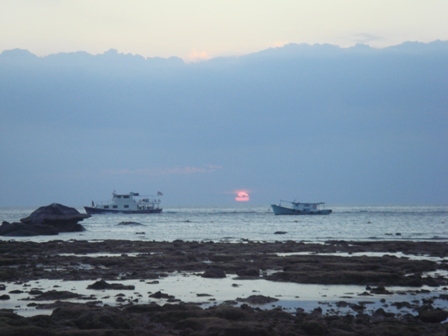 I took quite a few pics of the sun setting but that’s my fav becos of the position of the boats, the sun & the rock! Could I ask you a logistics question? Instead, we went to Perhentian, which is not the easiest place to get to…. (we fly to kl, then to Kota bahru and then cabbed to the jetty at kuala bersut)…. all for 9 dives too…. (we did that over 4 days)!! If you do know of any dive operators who could accept advance ticket bookings (with payment via credit cards), please do let us know!! Glad to know that fellow avid divers read my blog! 🙂 The direct ferry from SG-Tioman has ceased for quite a few years which makes it quite a pain to go there compared to the 4+hour direct ferry we used to get. There’s 2 ways to get to Tioman – by air or bus/ferry from Mersing. Tho’ most divers will take the cheaper bus/ferry option to squeeze in more dives. here’s a link which explains how to get to Tioman very clearly. U can also book your entire trip through travel agents here and for Paya Beach Resort go to Discovery Tours – 67334333. Then extend your stay accordingly. It’s a lot more convenient going thru the agent as they can help settle the transport there as well. If U wanna book your dives in advance at Paya, call Ben (a Singaporean) who owns the dive centre there – 96736883. But If you wanna stay at the other resorts it’s better to email the respective resorts in advance to check if they have available dive slots as they can be quite busy sometimes just to prevent disappointment. Our 1st trip there we wanted to stay at Berjaya as it’s a nicer resort and heard so much abt it but diving was fully booked so went to Paya instead & found a gem! Yeah…the whole setting is just perfect. NICE!!!! Thank you so much for the information!! Yes!! Now we can finally plan our trip to Tioman and we’ll definitely check out Paya! We’ve done the road trip to Mersing and hopping on the ferry to Tioman, but since they’ve regulated ferry services (could be late last year or early this year). we haven’t been able to get ferry tickets. Tioman is a perfect getaway as it’s closer to us (compared to Perhentian) and not flying there and back means more time to squeeze in more dives!! hehehe.. If you decide to venture to Perhentian at a later date, I would definitely recommend Perhentian Besar (bigger island), as the dive sites there are nicer. My husband went to Perhentian Besar last time but for the recent trip, we decided to try Perhentian Kechil (smaller island) and the dive sites were a tad disappointing (lots of dead corals – very heartbreaking)! If you do go to Perhentian Kechil, do stay near the dive resorts! We stayed at a resort that was a 15-minute track (through the woods) to reach Long Beach (where the dive centre was located), so that’s quite a challenge, especially after a long day of diving! We didn’t know better and found out the hard way!!! For Perhentian Besar, Arwana Eco Resort is definitely better as it right next to the jetty (important as lugging dive bags after a bumpy boat ride is quite challenging) and also right next to a dive centre! On our next trip to Perhentian Besar, we’ll be able to stay at Arwana! They were also all booked up during national day! If you need more information on Perhentian, just drop me a note! Thank you so much for the info on Perhentian! Air Asia is having air tix promo till tmw 16 Aug, so I bought tix to go to Sipadan (Tawau) next year! Can’t wait to dive there! But as for this year all my dive trips are planned already. Will probably keep Perhentian for next year! 🙂 I’ve read about the Eco Resort and it sounds fantastic! Will definately keep that in mind! Oh when U do go to Tioman, and if U do stay at Paya Beach Resort, do try to stay in the superior chalet & above. The standard chalet is worse than our ECP chalets here. Also, the dive instructor bringing U out for dives is called Funny (no joke)! She’s a very nice Japanese lady that speaks a lot of languages! My next trip is to Redang during Hari Raya weekend! Can’t wait! would like to ask u if u went diving with a dive instructor or by yourself? Yes, it’s with a dive instructor because they’re boat dives. Only shores dives are usually without instructor & it depends on the resort. The cost at Paya in Tioman for diving is – Leisure Boat Dive SGD$90 For 2 Dives Inclusive Of Equipment; 5 Boat Dives “Promo” $145 (Exclude Equipment). Since u’re new, start with easy places (but they’re not as nice). I assume U’ve not done ur advance open water? So, don’t attempt to go to the really nice places like Sipadan or Manado yet as U can’t dive as deep. Try Tioman, Redang, Palau Auh or Phuket – They’re good places to further ur confidence in diving & not expensive. And one more thing, if u’re not so confident in diving yet & would like to go in bigger groups of divers, try signing up for dive trips with a dive school. Can check out Deep Blue Scuba, that’s the dive school I go to and the instructors there are highly safety conscious & very friendly, they orgainse trips often so can check them out if U dun wanna plan it on ur own. Just a quick point of interest to regular Tioman visitors, or those wishing to go there in the future. Since we go to Tioman quite regularly, we’re seeing more and more travellers, especially from overseas, arriving at the Mersing jetty too late to catch their ferry, because it’s full. All this resulted in a higher chance of passengers left stranded during the busy holiday spells and weekends. In light of above, my advice to those who’ve booked a Tioman resort, or want to go to Tioman during the weekend or a public holiday: book your ferry tickets in advance, so you won’t be stranded at the departure jetty due to the ferry for that day being already full. By the way, if you’re into yummie food, and I think you are, then have a go at the roti place that’s on your left just after going through Woodlands. The shop looks a bit tricky, but the tosay gravy is utterly to die for. My fav haunts for great food in Johor is beef noodles in Kulai & seafood Zhi Char in Geylang Petah. 🙂 unfortunately I can’t share with u exactly where it is as its saved as GPS points. Haha!